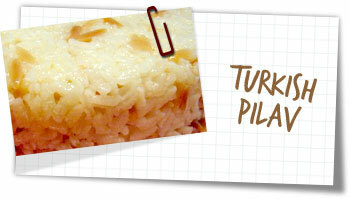 How delicious is Turkish pilav? Well, give this a try. It’s simple and different. The nuttiness of the butter transforms the rice into something quite amazing. It took me back to Turkey where I gorged myself on it at every available opportunity. Bring the stock to a boil then keep gently simmering. If using noodles, break into tiny pieces with your hands and set aside. Heat the butter an oil in a small pan until bubbling slightly. Add the Orzo or noodles, and stir continuously until browned (about 1 minute). Add the rice and stir well for 30 seconds to coat. Pour in the stock and add salt. Shake the pan a couple of times then place on a lid and reduce the heat to very low. Simmer gently for 10-15 minutes until all the liquid is absorbed. Remove the lid then quickly place a tea towel over the pan then return the lid. Leave for another 15 minutes. Take off the lid and fluff up the rice with a fork before serving or spoon into a small bowl and press it down – then turn out onto a plate for a perfectly formed mound of pilav. A great side dish to meat or fish. This is a great base to many other variations of pilav – try adding dried fruits or nuts to this version – it’s delicious.